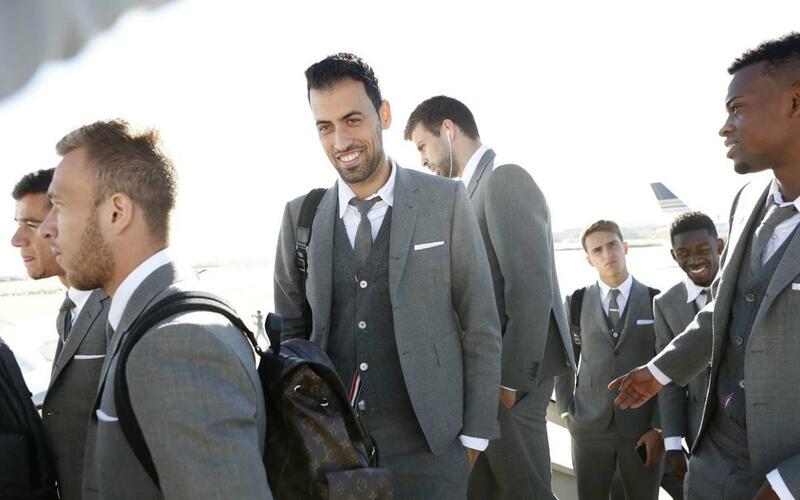 Today, the FC Barcelona players wore their new Thom Brownecustom made-to-measure suits for the first time on arrival in London to play the Champions League match against Tottenham Hotspur. Thom Browne was announced as the official off-field outfitter of the Catalan soccer club in July 2018. The team members, including head coach Ernesto Valverde, wore the signature Thom Browne medium grey two-ply Fresco suit along with a white oxford shirt, tie, 4-bar cashmere vest and black pebble grain leather brogues. Beginning with the 2018-2019 season and spanning the course of three years, the team will be outfitted in Thom Browne to wear during Champions League and some La Liga away matches. Thom Browne is widely recognized for challenging and modernizing today’s uniform: the suit. By questioning traditional proportions, Browne’s designs consistently convey a true American sensibility rooted in quality craftsmanship and precise tailoring. In 2001, Browne began his business with five suits in a small “by appointment” shop in New York City’s West Village and, in the years following, expanded his business to include complete ready-to-wear and accessories collections for both men (2003) and women (2011). Browne has also become known for his highly conceptual runway presentations which have gained global attention for their thought provoking and dramatic themes and settings. Browne has been honored with the CFDA Menswear Designer of the Year Award (2006, 2013, 2016), the GQ Designer of the Year (2008), the FIT Couture Council Award (2017) as well as the Cooper Hewitt National Design Award (2012). His designs are recognized by museums around the world including the Costume Institute at the Metropolitan Museum of Art, the Museum of Modern Art, the Victoria & Albert Museum, the Costume Museum at Bath and the ModeMuseum Antwerpen. The brand is currently offered in over 300 leading department store and specialty boutique doors across 40 countries and through 31 directly operated flagship stores in New York, London, Milan, Tokyo, Hong Kong, China, Singapore and South Korea.